What can I say about it? Nothing right now. I have to review it, so you can read all about it later. Instead, I'm going to weigh in on something that's been around the house for a while now. But since this fellow is on the cover of the new JazzTimes, I suppose I can opine and not seem too behind the times. I've developed a level of respect for David Sanborn ever since he hosted Night Music in the late '80s and early '90s. Many people have probably said as much, but there was one particular instance that made me rethink my original position on the frizzy-haired (now shorn off) alto man. Tim Berne was on the show once with his group and Sanborn sat in with them on Berne's "Hong Kong Sad Song." In the middle of the piece, it wasn't Berne but Sanborn who took the first alto solo. He cut loose with a shriek that rivaled the bandleader and drew on Dave's early years, hanging out with the pre-AACM guys in St. Louis. Then, a few years later, Sanborn appeared on Berne's Diminutive Mysteries album, where they played the music of Julius Hemphill. Somewhere around that time, he also released Another Light which featured Charlie Haden in the band and covered the Velvets' "Jesus." Kind of made you think there was more to this guy than just smooth stuff. If Pat Metheny ever had a chance to really beat Kenny G to a pulp, Sanborn might've been the one holding that chump down. 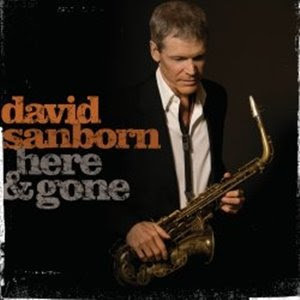 Which brings us to Here and Gone, Sanborn's latest, which pays homage to Hank Crawford, who played alto with Ray Charles and released numerous r&b sides of his own. For starters, he doesn't try to take Crawford's style and transpose it into some limp, electric context. There aren't any moist keyboards here. The first thing that struck me on the opening "St. Louis Blues" was how much Sanborn's tone sounds like John Zorn: they both have that pungent, reedy quality. (As Mort Sahl would say, is there anyone I haven't offended yet?) It's not exactly gutsy or down and dirty, but the arrangement puts Sanborn in the presence of a group that sounds like a good, modern day swing band. Among the guests on the album, Eric Clapton plays and sings on "I'm Gonna Move to the Outskirts of Town," which he pulls off because he pulls back. He doesn't try to be Louie Jordan, or whoever else did the song, and he focuses on the old time lyrics without trying to make them cute. Joss Stone on the other hand really does the little-chick-trying-to-sound-big-and-sassy shtick and while she has the pipes, it still sounds a little forced. Guitarist Derek Trucks appears on "Brother Ray" and his leads, the call and response of the horns and Sanborn's attack all sound pretty tight. Hmmm, that connection has me thinking that for Sanborn's next album, he ought to collaborate with ex-Naked City keyboardist Wayne Horvitz. With that guy's writing and Dave's tone, that could be an amazing album. If I listened to Anthony Braxton's For Alto album every morning while getting ready for work, maybe I'd have a better outlook on things. Geez, I didn't mean to be away for so long. Since I last wrote, saxophonist Rudresh Mahanthappa came to Pittsburgh for the International Festival of Firsts and premiered a new piece that was spellbinding. I wrote a review for JazzTimes that should be up on their website by the time you read this. (Check out www.jazztimes.com) I picked up a copy of Rudresh's 2004 album Mother Tongue last week, and it has me thinking that this guy is really on the cutting edge of something big. He has amazing technique on his horn and his compositions are really astounding - going to places that haven't been gone before without any cliches or highminded ideas about "this is world music," or anything like that. Yet again, musicians have left the earth. And while the three I'm thinking of didn't die right around the same time, the old "they always go in threes" adage seems to apply. Guitarist Hiram Bullock died in July as did tenor saxophonist Johnny Griffin - something I didn't hear about until last week! - and then arranger Neal Hefti died on October 11. But Hefti is probably best known to people my age due to a song for which he was supposedly credited with "word and music": the Batman theme. Like any simple song that became a hit, he said that it was really hard for him to write. It took a lot of time to come up with that 1-4-5 riff. Where would the music world be without it? Johnny Griffin is one of the last tenor giants of the early 50s era. I know I say that everytime one of those guys dies, but damned if it isn't true. 80 years old, he was. Heart problems were listed as the cause. Griffin came to Pittsburgh several times for the Pitt Jazz Seminar and was a really gracious guy. Who knows how many times he was asked what it was like playing with Thelonious Monk, but he still was willing to tell me stories about the pianist hiding the written music from Griffin, insisting he learn it by ear. Listening to Monk's Misterioso on Riverside, Griffin is amazing enough playing with the band, but then a few choruses into solos on a couple of tunes, you hear, "I got it, I got it," and the rest of the band drops out. Griffin just blows away without any need for a safety net. Hiram Bullock's death really came out of left field. He was only 52 but he supposedly was suffering from a throat tumor. He did a lot of slick music, and for a time was best known as the original guitarist on David Letterman's NBC show. But he also played on many of Carla Bley's albums, so he had pretty diverse qualities.